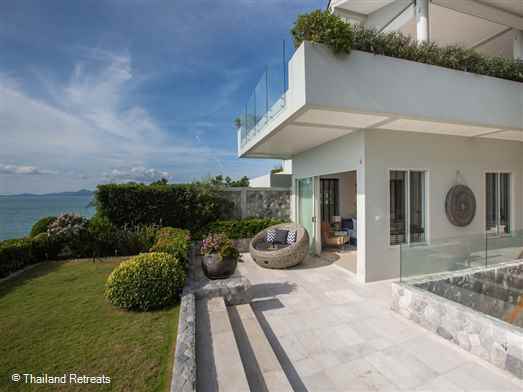 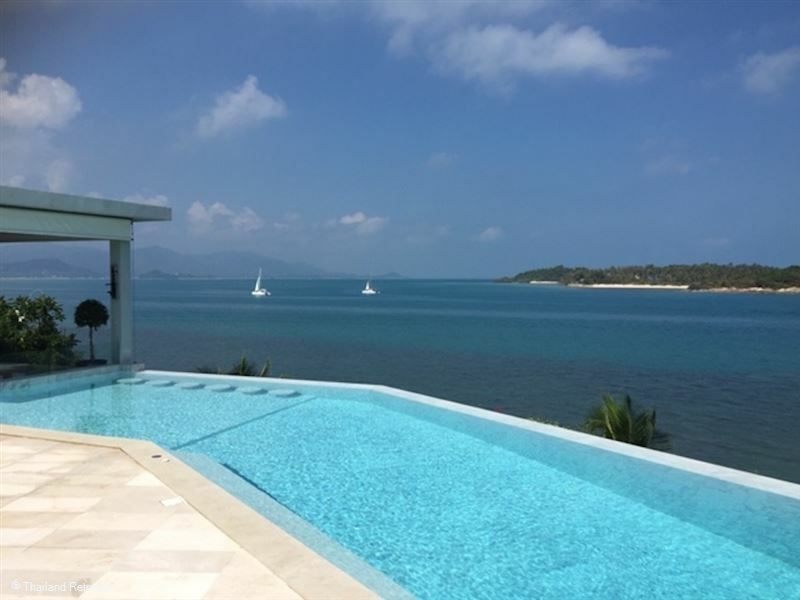 YO Villa is a stunning contemporary design villa located above a semi-private beach in the popular north east of Koh Samui. 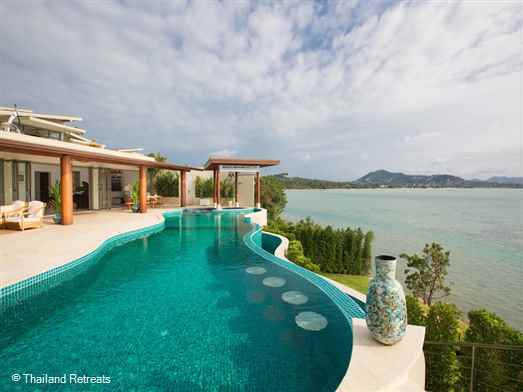 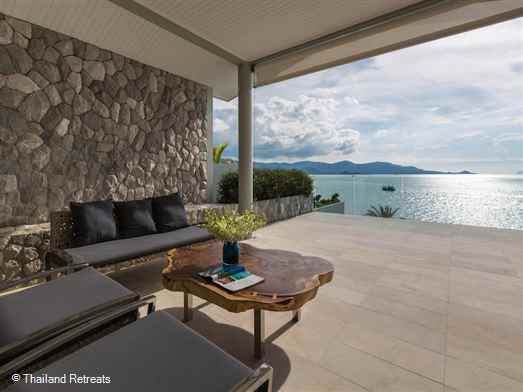 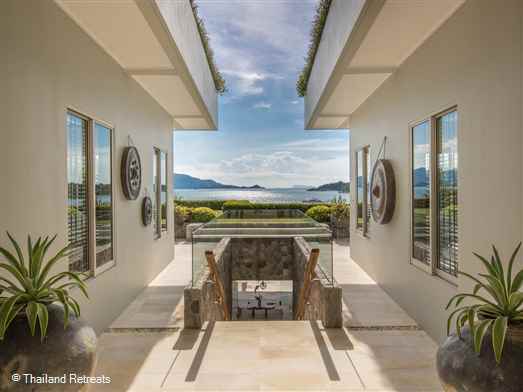 Stunning views, private infinity pool, fitness gym and a cinema room all add up to an amazing Koh Samui holiday villa. 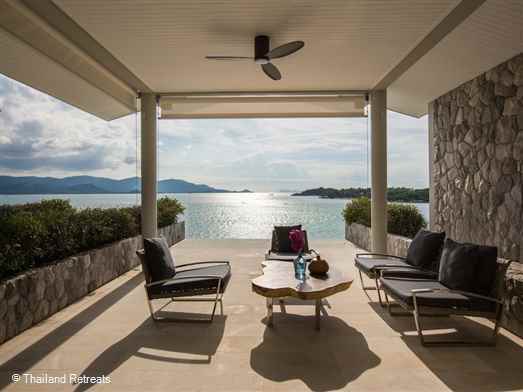 YO Villa is one of our finest luxury oceanfront Koh Samui villas available for luxury villa holiday rental set within the exclusive Sunset Cove development enjoying Jaw-dropping views across to the island of Koh Som, amazing sunsets and access to your own private beach area. 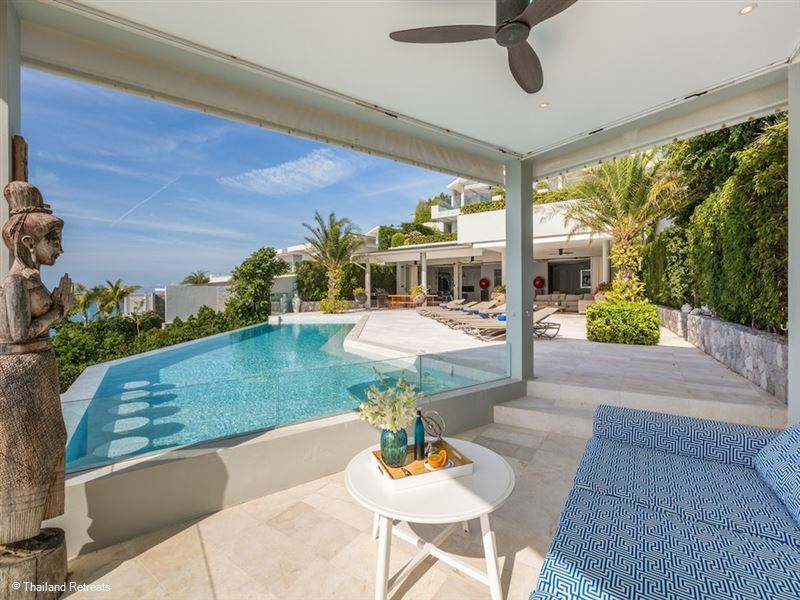 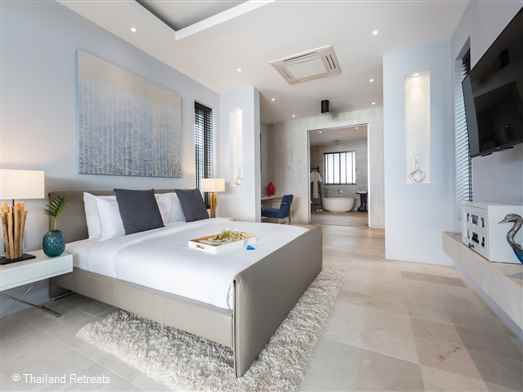 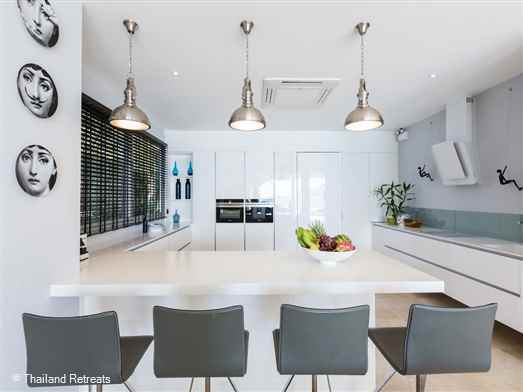 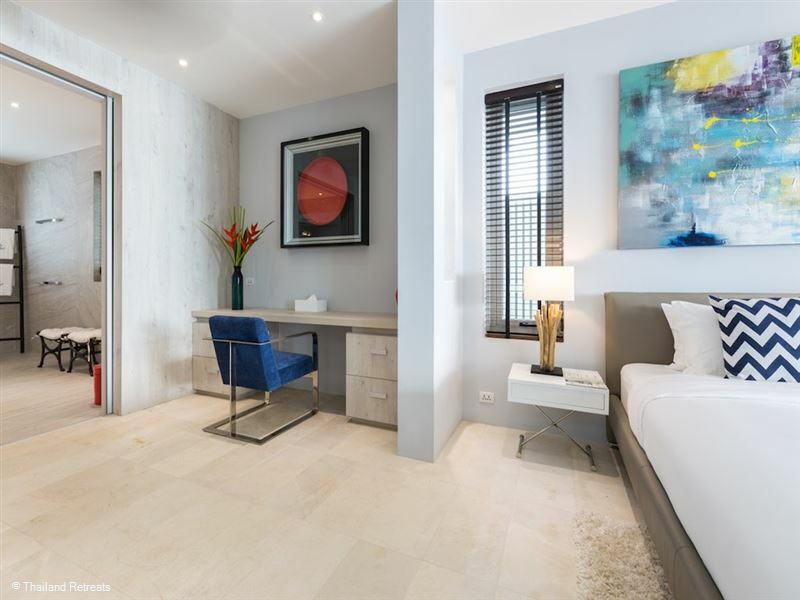 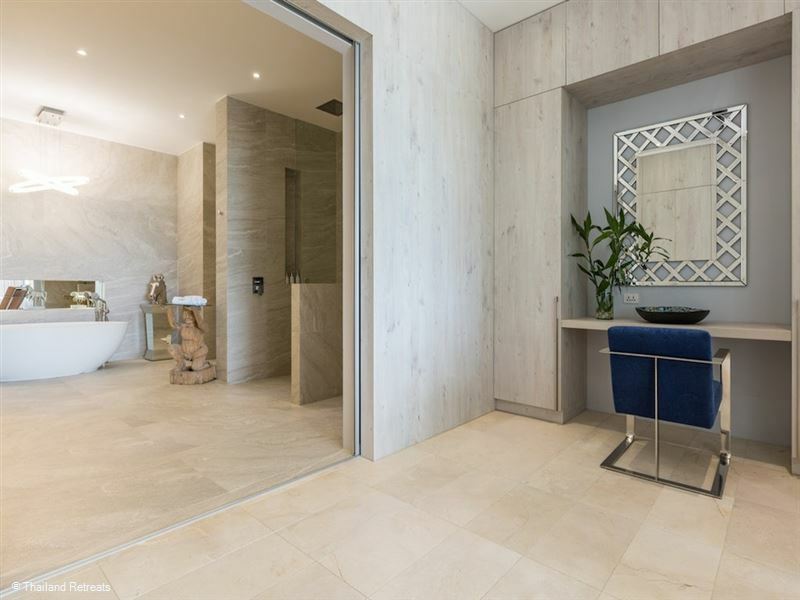 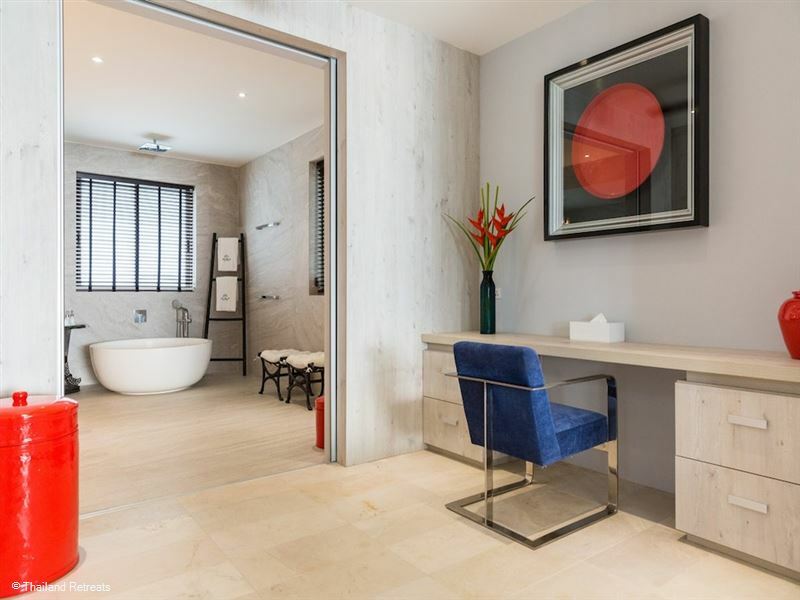 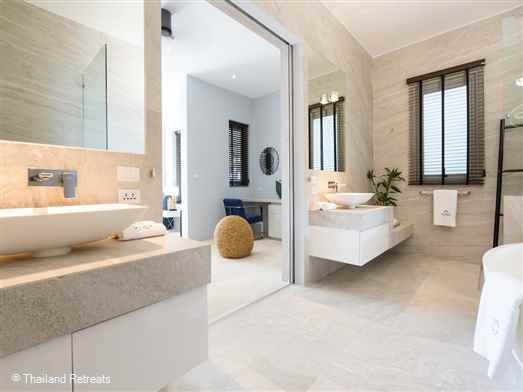 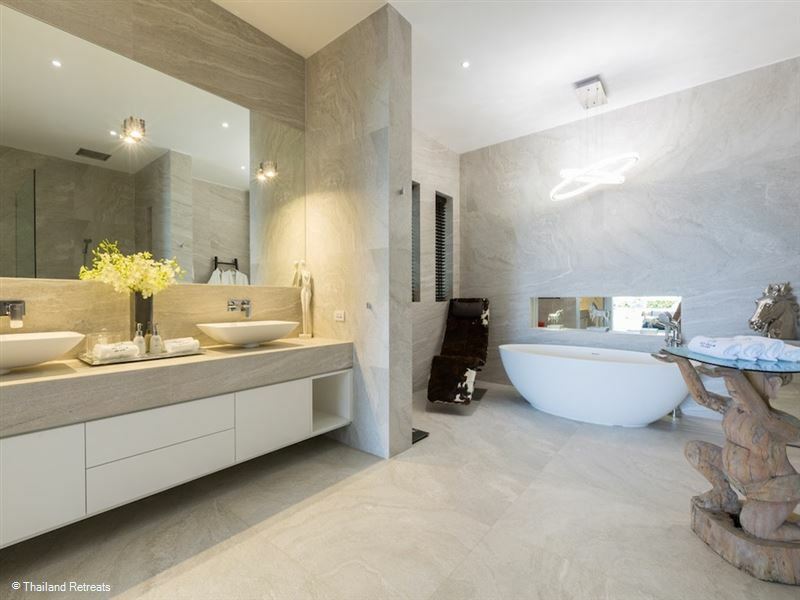 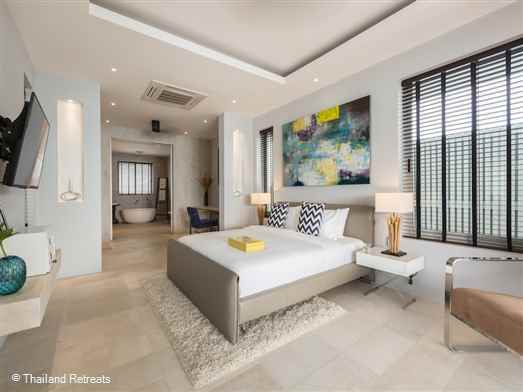 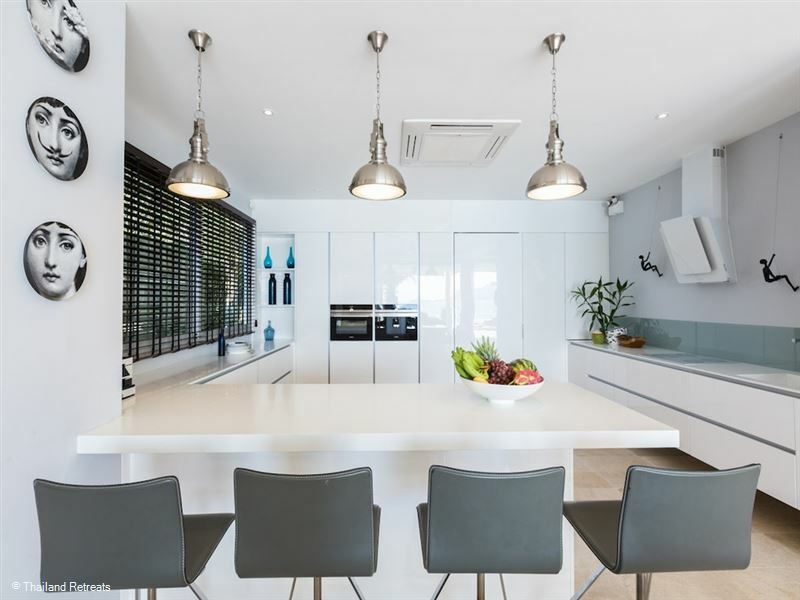 Yo villa has expansive living areas spread over 3 levels and features stylish contemporary design high-end interiors and a staff service worthy of 5 stars. 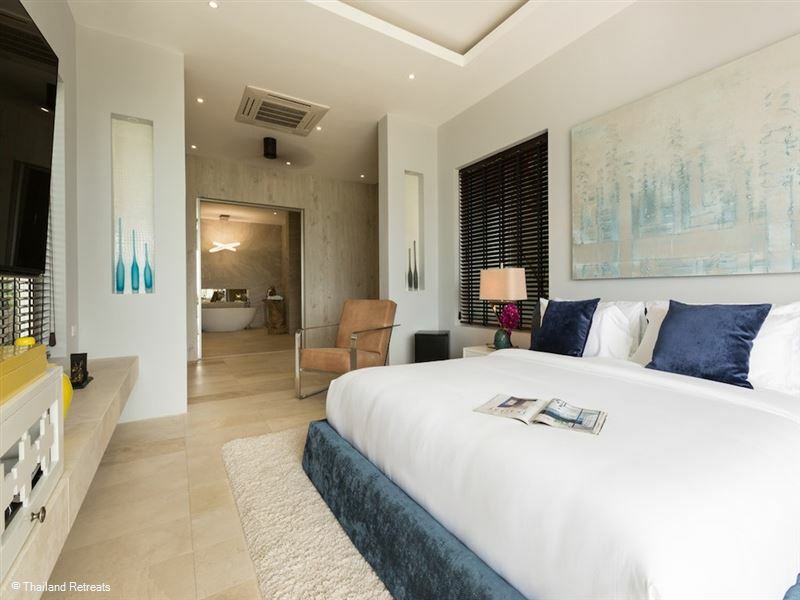 The villa has 4 sea view bedrooms all with sumptuous bathrooms and dressing areas/study area ideal for families and groups of friends alike. The focus is on tropical living with spacious indoor and outdoor lounges and dining spaces enhancing the beachfront surroundings. 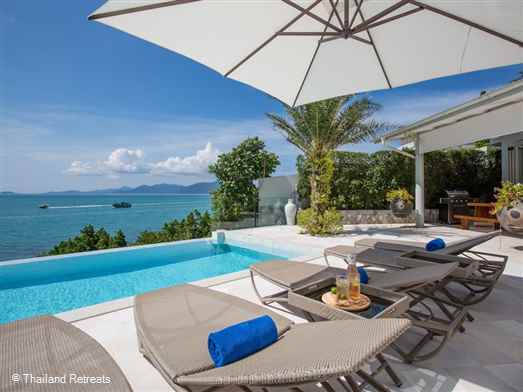 Yo villa is entered through large deep red ornate electronic gates at the middle level of the villa with a walkway though the centre leading to an immaculate lawned area ideal for a yoga session. 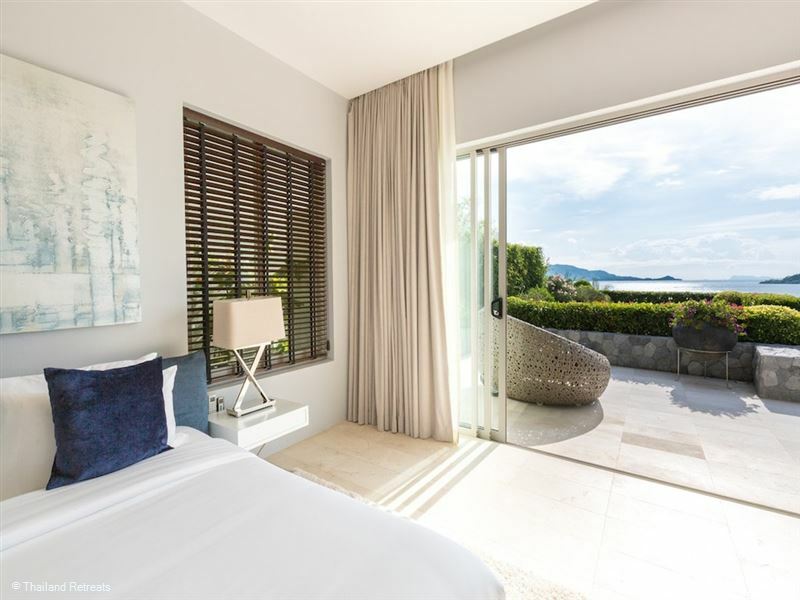 The lawn is overlooked by the spacious sea view master bedroom ensuite and a just as spacious guest bedroom ensuite on the opposite side of the terrace. 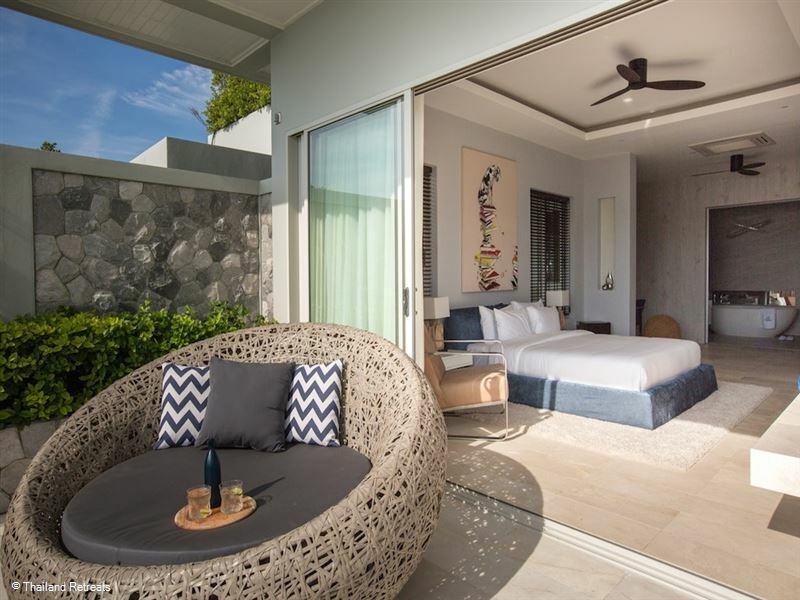 Each of the bedrooms have private terraces furnished with a double cushioned lounger and views over the lawn to the ocean. 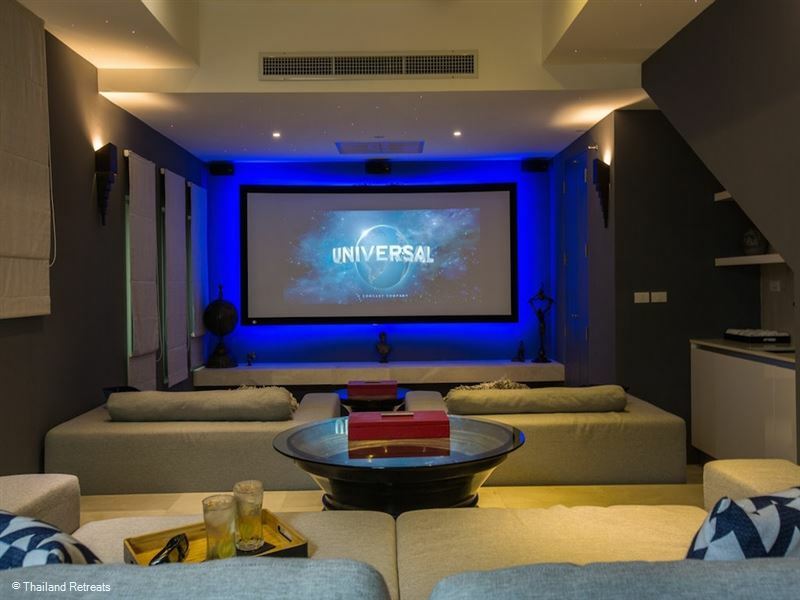 At the rear of this level is a top-spec cinema room with state of the art 130” curved projector screen with epic 7.1 surround sound system. The comfortable custom made cinema seating, a bar area and bathroom has been well thought out for maximising the movie theatre experience. 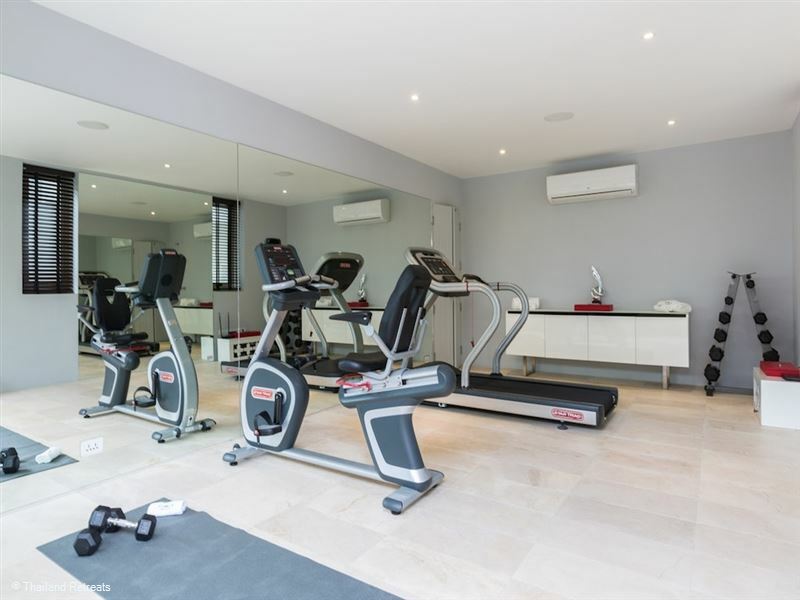 The fitness gym with treadmill, exercise bike and weights can also be found at the rear of this level. 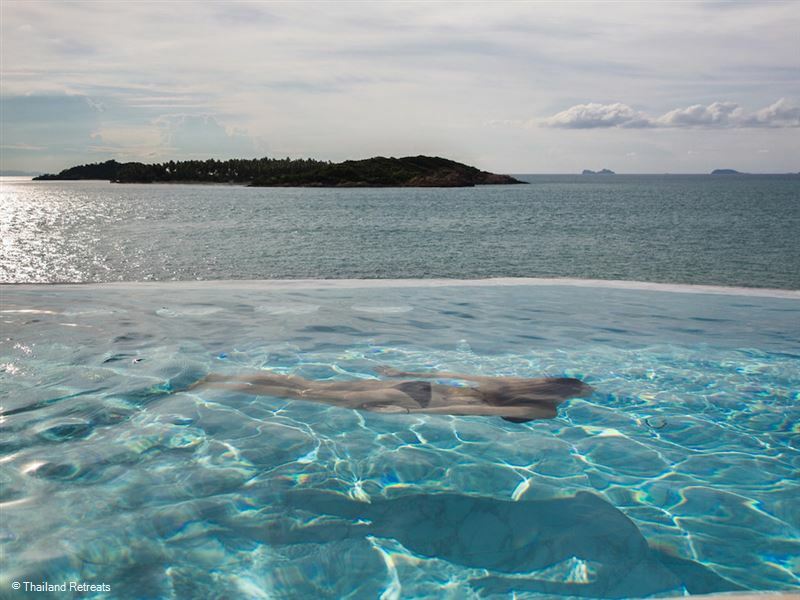 On one side of the swimming pool there is underwater seating – perfect for sipping a cocktail whilst watching the sun go down. 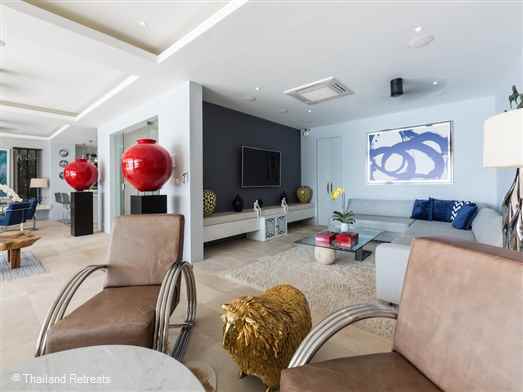 A cool sala with sumptuous sofa seating, soft lighting and a cooling fan for both day and night time enjoyment completes this ideal ambience. 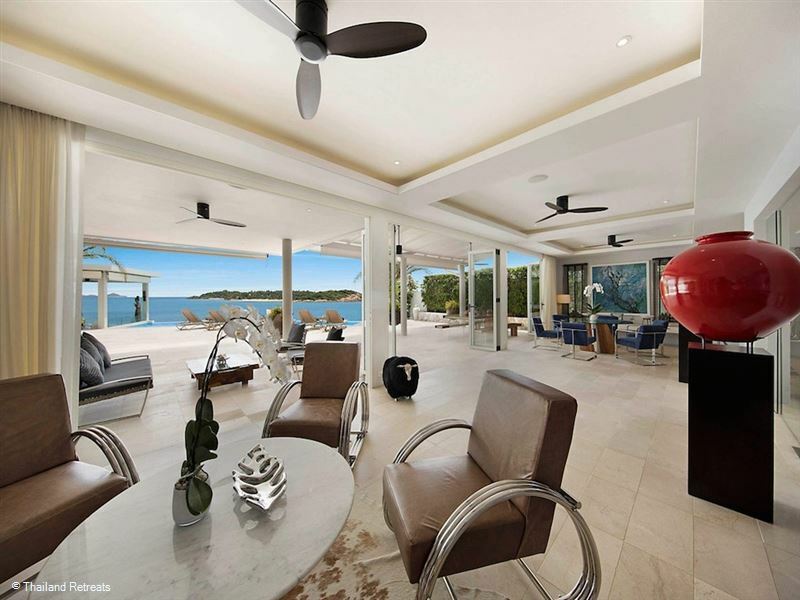 Fold back glass doors create the concept of indoor outdoor living with the spacious L shaped indoor lounge featuring a large wrap around sofa with 65” flat screen smart TV’s with an IPTV media box and satellite TV with surround sound and indoor dining areas with round tables. 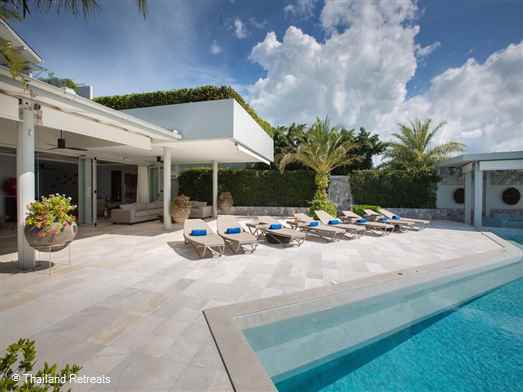 Covered terrace outside the lounge provides for a further sofa and cushioned seating overlooking the pool and beyond. 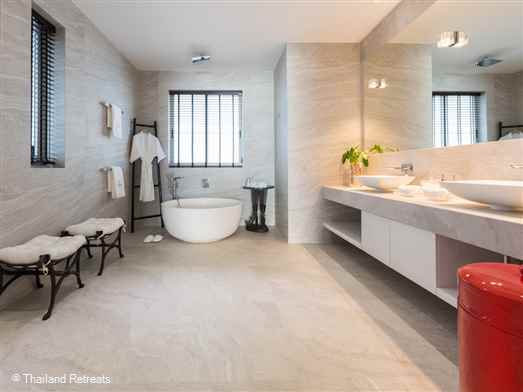 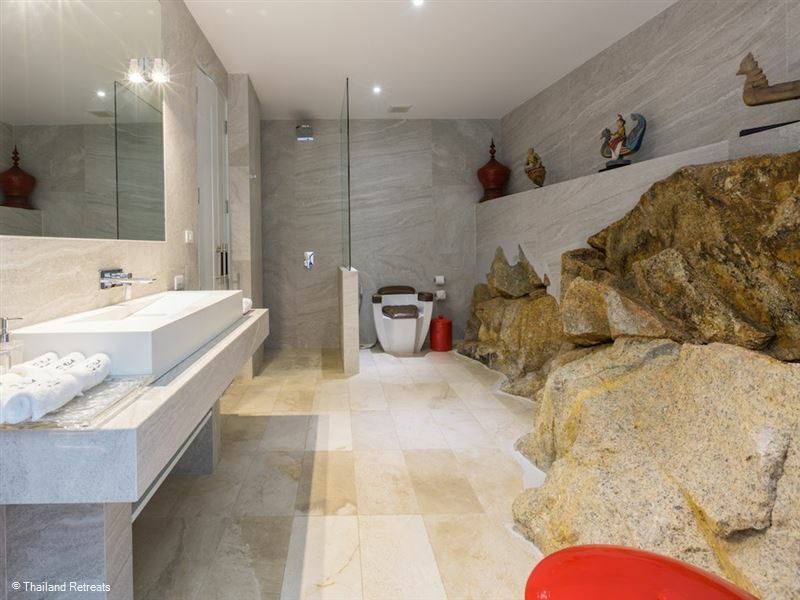 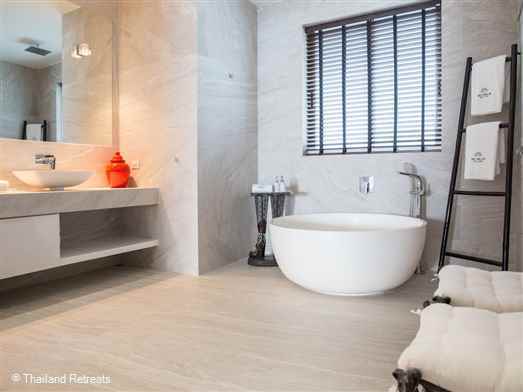 A large house bathroom at the rear features a wall of existing large rocks that had been incorporated in the design. 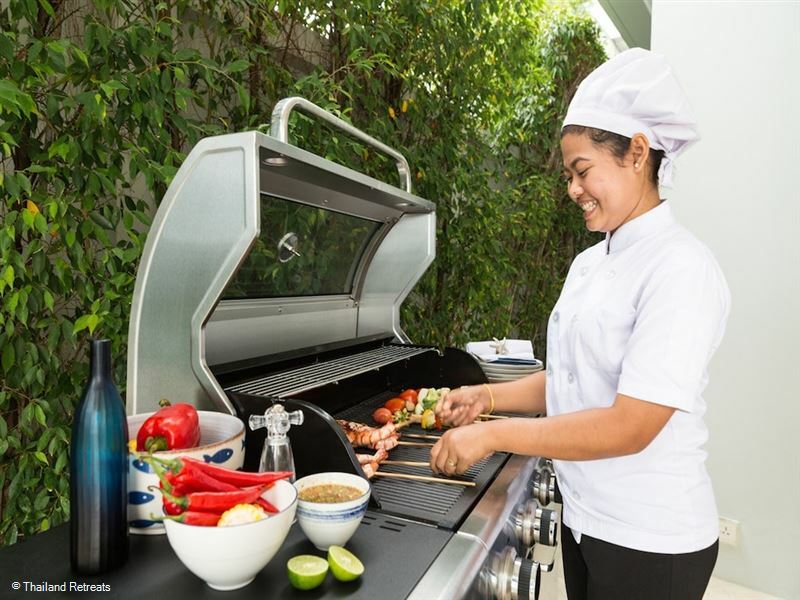 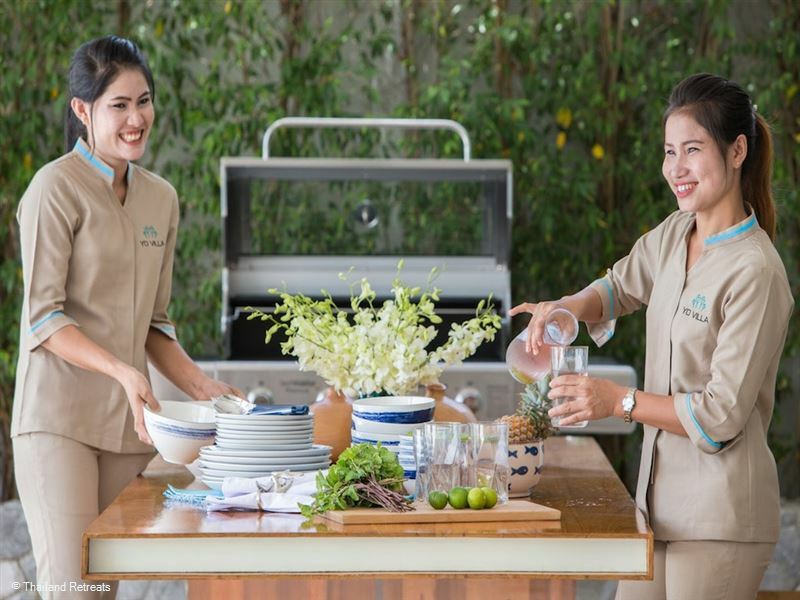 On the other side of the terrace is the fully equipped guest kitchen and a staff kitchen at the rear. Outside on the covered terrace close to the pool is outdoor dining and BBQ area in the form of bench seating and provides for a gorgeous setting for meals during the day and night. 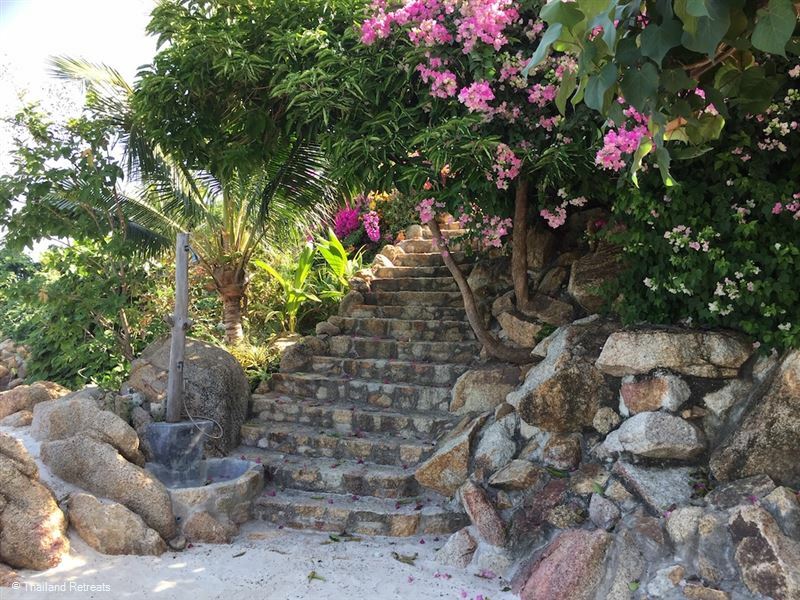 From this level stone steps lead down from the side of the terrace to a wonderful sandy space with sunloungers, a hammock and flat rocks (perhaps for ypga) and just a step into the sea. 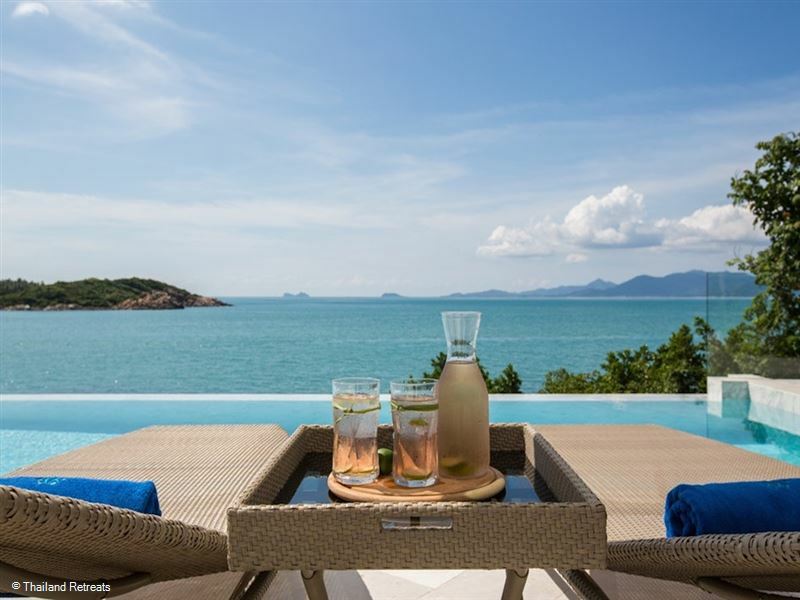 A small fridge for that cool beer means you don’t have to move until the complimentary kayak beckons for you to be off exploring the coastline in minutes. YO Villa is perfectly located close to the excitement of Chaweng & Bophut but far away enough to ensure a private holiday experience. With its stunning location and expansive outdoor area YO Villa is a great choice to hold a memorable occasion. 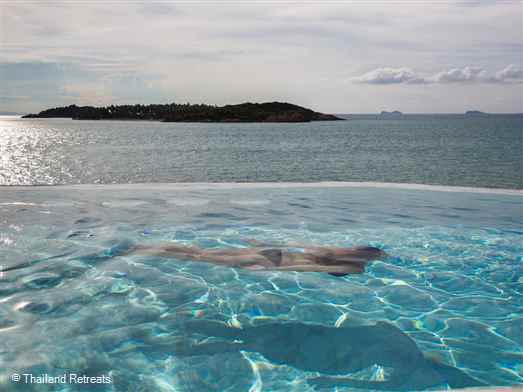 From private birthday parties to corporate events, weddings and yoga retreats. 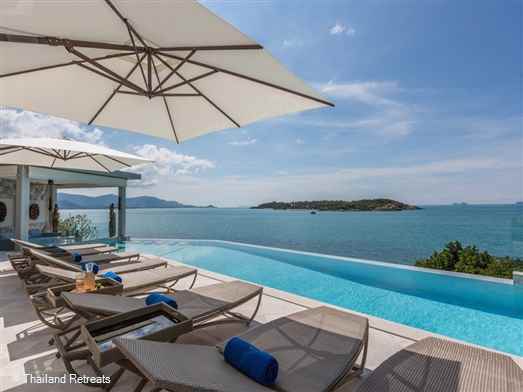 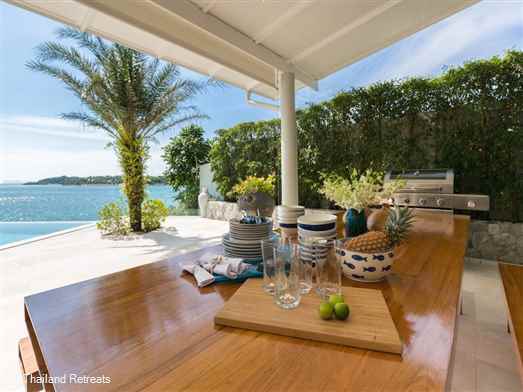 This stunning beachside villa can play a wonderful host. The white soft sands on the west facing unspoiled palm fringed Plai Laem beach stretches for 2 km however the sea is quite shallow and swimming is restricted to just paddling in most places. 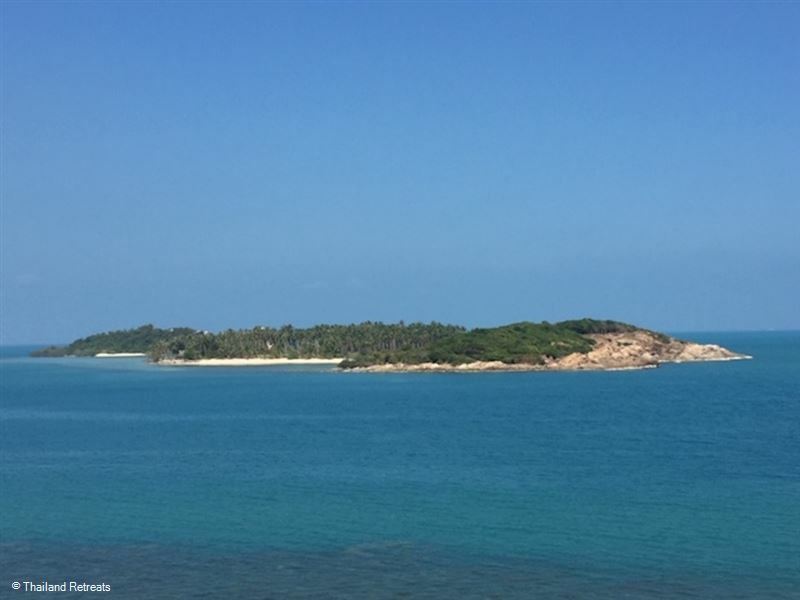 The popular beach of Choeng Mon with more activity is just a few minutes drive away. 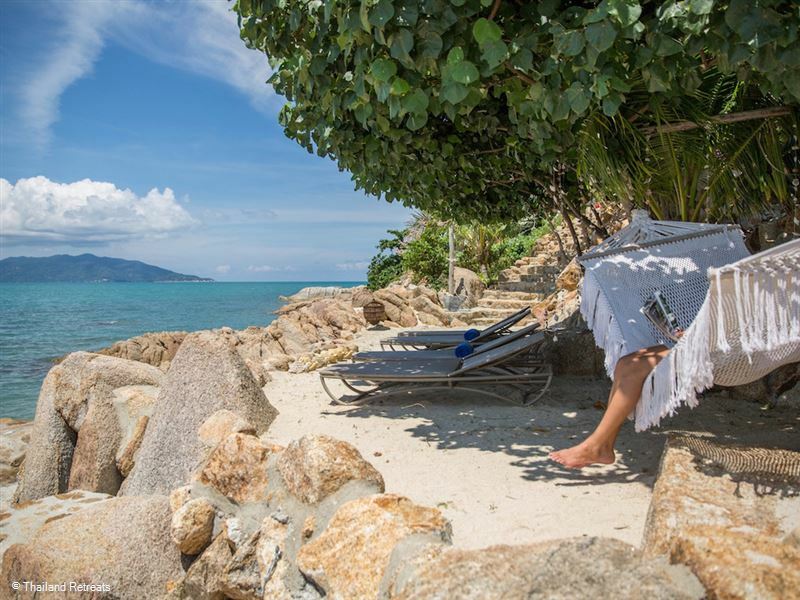 The view from Plai Laem beach is stunning and is one of the best places to see Koh Samui’s amazing sunsets as the sun disappears beyond the sloping hills and north coastline. 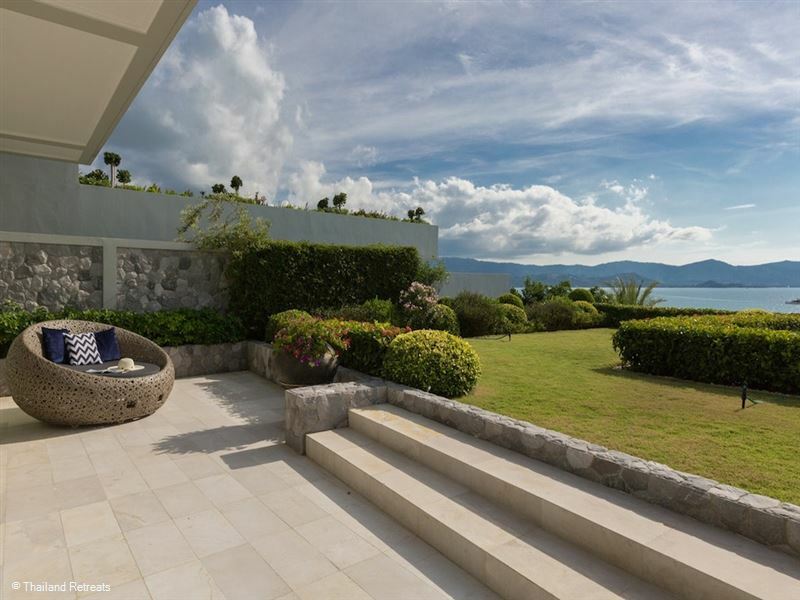 An ideal place to relax, read a book and enjoy the scenery. 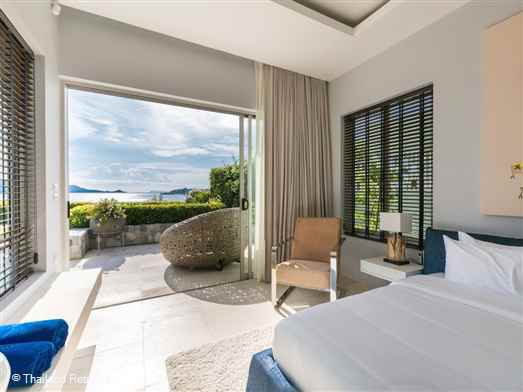 PAYMENT TERMS Low + High + Peak Seasons: 50% on confirmation date with balance due 30 days prior to arrival Christmas/New Year Season: 50% on confirmation date with balance due 30 days prior to arrival For booking within 30 days of arrival, full payment due upon confirmation Payment can be made in GBP and USD by secure online credit card (Visa, Mastercard or Amex) or by bank transfer to our nominated company accounts. Credit card payments in GBP with a UK registered card are Free of Charge. Credit card payments in USD with a non UK registered card a 3% admin fee will apply. CANCELLATION POLICY For Low, High and Promotional Seasons, all payment (s) received will be credited booked for within 9 month of the cancellation date if the booking is cancelled after the payment (s) date. 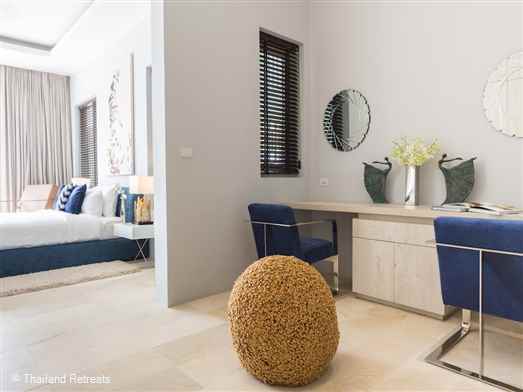 For Peak Season, Christmas/New Year and if the booking is cancelled after the deposit and/or balance payment date, all payment (s) received will be forfeited or refunded in pro-rata shall another booking be secured for the same period that has been cancelled. 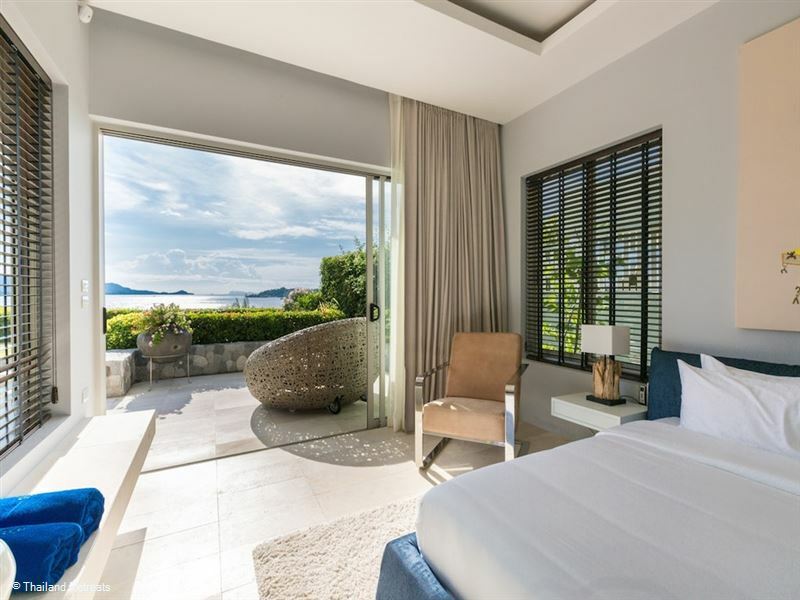 Early departure, whether immediately on arrival or later during the dates of stay, will be considered a cancellation and all funds will be forfeited. 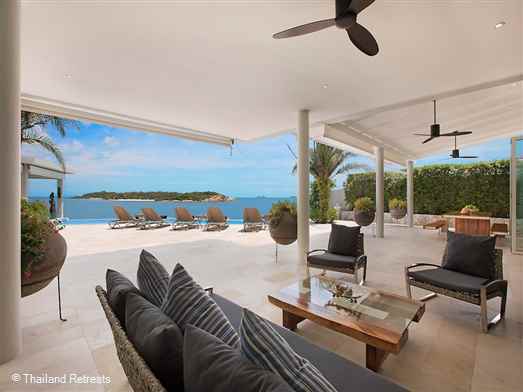 A modern luxury oceanfront villa with a super pool, pool table and access to the beach and use of kayaks. 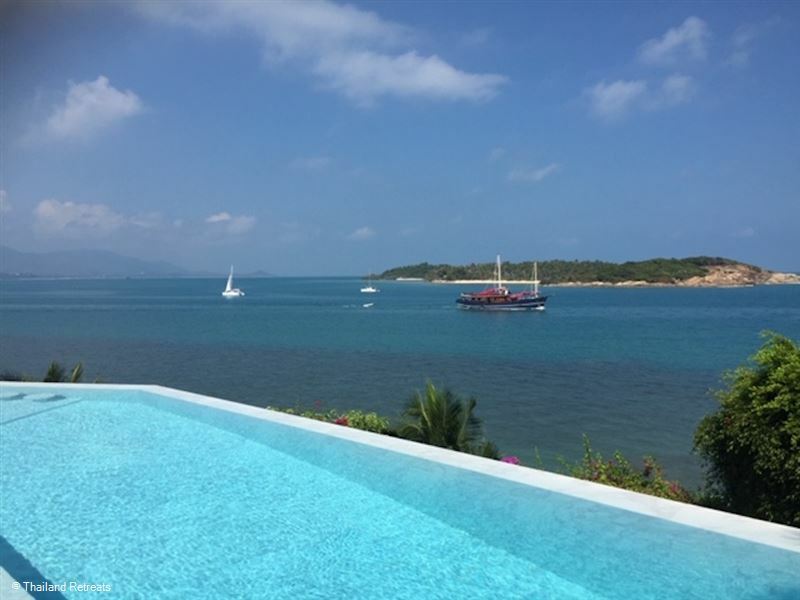 Has one of the best sunset views on Koh Samui.Villa Offers rates for 3 or 4 bedroom use certain seasons. An elegant contemporary design villa set on the waterfront on the exclusive Plai Laem peninsular in the north east of Koh Samui. 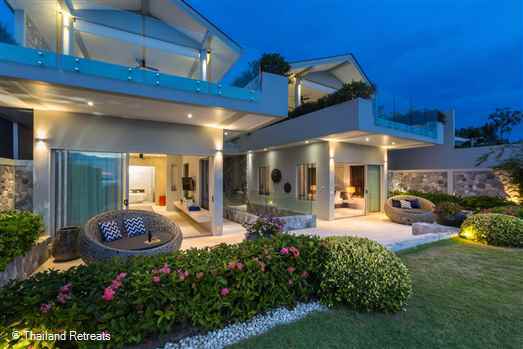 Lawned frontage. 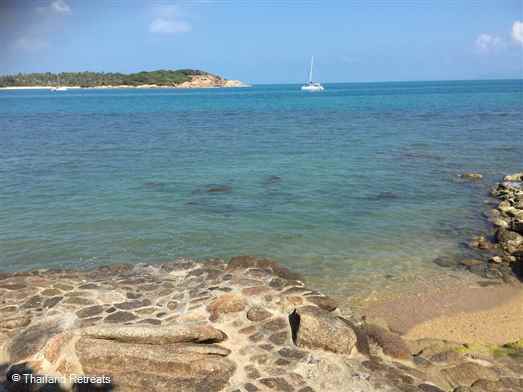 5 minutes walk to a sandy beach. 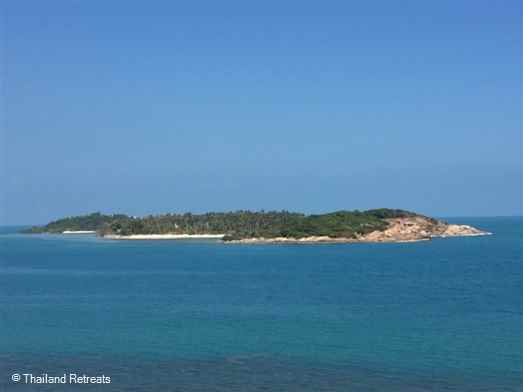 5 minutes drive to popular Choeng Mn beach. 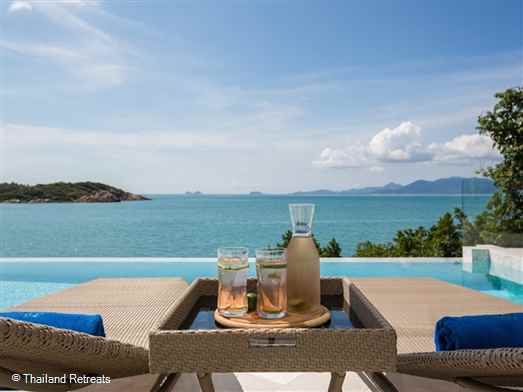 15 mins to Chaweng & Fisherman's Village.